Today is a Special Guru Rinpoche Day! This day is a very important day as it is not only Guru Rinpoche’s birthday but this year is the Monkey year which is the year Guru Rinpoche was born. This is a very important day to practice and supplicate Guru Rinpoche. It is also the birth day of H.H. Dudjom Rinpoche Jigdral Yeshe Dorje. 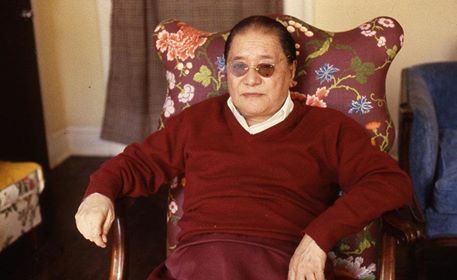 Dudjom Rinpoche was a householder, a yogi, a writer, and a master and guru with a family, married twice. His first wife was Sangyum Kusho Tseten Yudron; their eldest daughter, Dechen Yudron, is now in Lhasa, taking care of Dudjom Rinpoche’s seat, Lama Ling, in Kongpo. Their eldest son, Kyabje Dungsay Thinley Norbu Rinpoche, was himself considered a great master and esteemed Nyingma scholar like his father. Their second son, Dola Tulku Jigmed Chokyi Nyima Rinpoche of the mainly Sakya lineage, was the father of Dudjom Yangsi Rinpoche. Their daughter Pema Yudron lives near Dola Rinpoche in Qinghai. Their third son, Pende Norbu, who is also a tulku, is now living in Nepal. Their fourth son, Dorje Palzang, went to school in Beijing in the late 1950s, but was killed during the Cultural Revolution. Another daughter, Dekyong Yeshe Wangmo, was recognized as an incarnate ḍākinī and was believed to be an emanation of Yeshe Tsogyal, but died when she was a young woman. It was said that since birth she had no shadow, which meant she had fully attained the rainbow body (‘ja’ lus) while in the flesh, and that she displayed many miraculous signs and all who saw her felt great devotion. Dudjom Rinpoche wrote the now famous “Aspiration Prayer to Journey to the Realm of the Copper Colored Mountain” after her death; it is said the inspiration for this prayer was her parting gift for sentient beings. Dudjom Rinpoche’s second wife is Sangyum Kusho Rikzin Wangmo, and they had three children, including one son and two daughters. Their elder daughter is Chimey Wangmo, and their younger is Tsering Penzom. Their son, Dungsay Shenphen Dawa Norbu Rinpoche, is spreading his father’s teachings in both Europe and the United States. Dudjom Rinpoche’s two grandsons via his son Dungsay Thinley Norbu Rinpoche are also renowned lamas. Rinpoche’s Sangyum, Jamyang Chhodon, comes from an impressive blood lineage of Kuenkhen Pema Karpo from the Drukpa Kagyud lineage in Bhutan. One is Dzongsar Jamyang Khyentse Rinpoche, who is the rebirth of Dzongsar Khyentse Chökyi Lodrö; he is a great master and has a huge following, and oversees many monasteries and educational and retreat centers in Tibet, Bhutan, Nepal, India, and worldwide. In accordance with the wishes of his teachers, he has travelled and taught throughout the world, establishing Dharma centres in Australia, Europe, North America, and Asia. His organisation Siddhartha’s Intent organizes Rinpoche’s teachings, while the Khyentse Foundation is dedicated to providing for the needs of Rinpoche’s responsibilities. He is also (under the name Khyentse Norbu) an acclaimed film director and writer. The other grandson is Garab Dorje Rinpoche, who is a yogi practitioner and has a growing following in Bhutan and East Asia. Rinpoche’s eminent ancestry ensured that he would be genuinely immersed in Dharmic activities from his childhood onward. Apart from his root gurus—Dudjom Rinpoche and Dungsay Thinley Norbu Rinpoche—he studied under many renowned and accomplished masters, and pursued higher studies at Penor Rinpoche’s Institute and at the Mindrolling Monastery in India. He is responsible for the welfare of several hundred monks at Rangjung Woesel Choeling Monastery, nuns at Thegchhog Kunzang Chhodon Nunnery, and an old folks’ home and four retreat centers in eastern Bhutan. He has also established Buddhist study centers globally. At present, there are twenty-five Troma Chod Groups, ranging from five hundred to over a thousand members, throughout Bhutan; there are also Troma Chod Groups in Taiwan, Malaysia, and Singapore. Garab Dorje Rinpoche is one of the very important lineage holders of the Dudjom Tersar Lineage. Dudjom Rinpoche’s grandson the fifth Kathok Situ Rinpoche (son of Shenphen Dawa Norbu Rinpoche) is based in Nepal and Bhutan. He is the “heart son” of Chatral Rinpoche, under whose guidance he is actively involved in Dharma activities in the East. Lama Tharchin Rinpoche gives a personal and brief history of Kyabje Dudjom Rinpoche, including an explanation of several of his previous incarnations on the anniversary of His Holiness’ passing, January 2004 at Pema Ösel Ling. Purchase DVD link ~~~> here.